Rev. 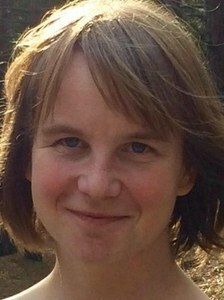 Iris Speckmann represented the Dutch Mennonite Conference at the Mennonite World Conference’s Assembly in July 2015 and at the World Council of Churches Assembly in November 2013. She graduated from the Free University (VU) Amsterdam in 2005 and was ordained as a Mennonite minister. She is currently teaching, researching and preparing a Ph.D. at the Mennonite Seminary of VU Amsterdam. This blog was originally posted on the World Council of Churches Pilgrimage of Justice and Peace blog: http://blog.oikoumene.org/, Twitter: @wccpilgrimage. This opening was an acknowledgment of what happened on these Pennsylvanian lands where we were gathered from all parts of this world as Mennonites. The ugly parts of the story were not censored, which to me is a huge step forward for a global church conference on American soil. In the lead up to the World Council of Churches Assembly in Busan 2013, I had a chance encounter with a group of indigenous participants. As I was a delegate, I was asked by a small Mennonite relief organization (Wereldwerk) to help them to find their way in the World Council of Churches (it was like the deaf helping the blind, as I was new to my role as a delegate, too). Since then I am very sensitive how marginalized and indigenous people read the biblical stories, and look at the church. I can very much understand that some of the indigenous people present in Busan 2013 were not too happy with the new WCC theme of “pilgrimage”. The Christian virtue of “obedient restlessness”, the strong urge to bring the gospel to every corner of the world, has tainted historical relations between peoples a darker shade – and this we need to address. Christians were not always as kind as the Prince of Peace they preached. To me, the Pilgrimage of Justice and Peace can only be used as a counter image of that aggressive kind of Christian traveling. How wrong were we as Christians when the church went on crusades, killing where we went. How wrong and unjust were we, as we saw ourselves as pioneers, making other peoples’ lands our colonies. This image of a pilgrimage can be very strong, as an image for a journey of remorse and as a quest to find better ways through present times. To me it is a strong image if it can bring back memories of real, nonviolent discipleship, reminding us how Jesus traveled. Not as a colonizer, not as a winner, not as a conquistador. On his journey to meet the people with his message of reconciliation and healing, his presence was sometimes prophetic – especially to his own people! – other times gentle and full of grace – especially to the foreigners (“enemies”) of his days. Traveling through hostile regions, he was even willing to be open to new insights, and willing to change his mind, for instance after the response of a woman in Canaan (Matthew 15, 21-28). Too often indigenous were looked at as the people of Canaan in the book of Joshua; the story about the promised land for God’s Chosen People has too often been used to legitimize the “removal” of indigenous peoples, in the past – and in the present economic exploitation of former indigenous lands. Even if they became Christians, indigenous people stayed “savages” to the colonizers, savages who didn’t make “proper use” of the land, or didn’t live the way they “should”. It was legal, even a virtue to “kill the Indian, save the man”’. Going on a pilgrimage as a church means doing justice to this past of colonization. To me it is accepting the invitation to move beyond that past, by coming in peace, and to be a guest in the stories of the people we meet. Doing justice to this past means learning to listen to what reconciliation entails, also from their perspective. It means to stop thinking that we are the only one entitled to name terms and processes for “true” reconciliation. It is remembering our Prince of Peace as the Peacemaker for our times. 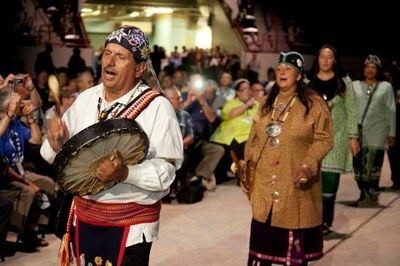 Opening of the Mennonite World Conference. © Jonathan Charles, Habecker Mennonite Church. ← Practical Suggestions for Doing Justice: Do What You Love to Do!